In Norway, a hexachlorocyclohexane having a melting point of 146°C (I) was isolated from cyclohexane chlorination products and was deemed to be another stereoisomer of the C6H6Cl6-isomer of the 1,2,3,4,5,6 series resulting from the chlorination of benzene. O. Hassel determined its dipole moment, i.e. of I, and placed I by mistake as a zeta-isomer in the series of the five stereoisomers alpha, beta, gamma, delta, epsilon already known without checking by a simple reaction which positional isomer it actually was. Determined by dipolmoment measurements: e.e.e.a.e.a, found: 3,2 D, calc. 3,5 D [14b]. RAMAN-spectra - 611b in . 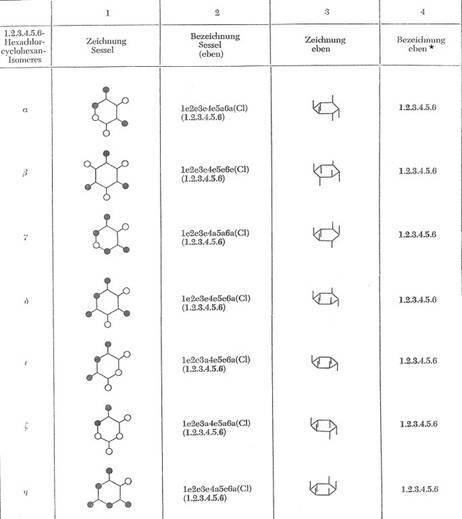 In Table 2a there will be shown the spatial structure of the seven isomers. Our proof of constitution: zeta-I belongs to the 1,2,3,4,5,6 series because it is converted to benzene through the zinc dust treatment, cleaving 6 Cl atoms. When exposed to alkali it reacts, forming trichlorobenzenes (cleaving 3 HCl). Our proof of configuration: Short-term chlorination of zeta-I in an open vessel to CCl4 resulted in an oil from which were obtained by means of chromatographic adsorption: delta-1,1,2,3,4,5,6-hepta­chloro-cyclohexane with a melting point of 138 to 140° C (delta-IV of the configuration ea.e.e.a.a.e) and alpha-1,1,2,3,4,4,5,6-octachloro-cyclohexane with a melting point of 93°C (alpha-III of the configuration ea.e.e.ea.e.a). ** About the so-called zeta-isomer, an C6H6Cl6 isomer[i] with Cl-atoms in the position 1,1,2,4,4,5 [and not in 1,2,3,4,5,6 as believed Hassel and co-worker and called it by mistake zeta-isomer] see 5 publications in  and also next page. A determination of the constitution always ranks before determination of the configuration (constellation)! 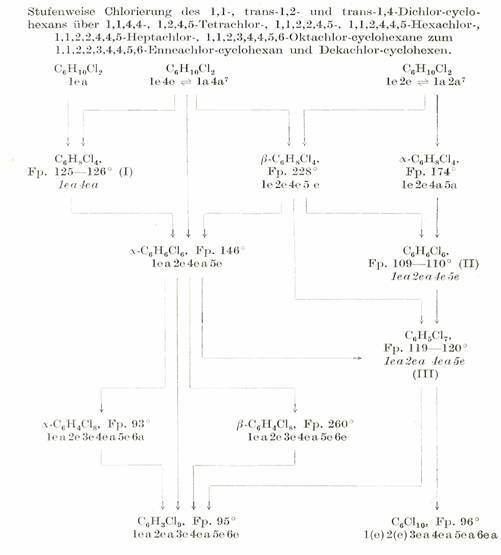 The author was able to put right this mistake when he early started systematic studies of the chlorination of cyclohexane and developed the so-called "cyclohexane family tree" of the chlorination products of cyclohexane: Table 2b. The so-called zeta-isomer of Hassel turned out to be 1,1,2,4,4,5-hexachloro-cyclohexane. The author proposed to eliminate the designation zeta for it and to use the letter zeta for the sixth stereoisomer of the 1,2,3,4,5,6 series by then actually isolated from the so-called delta-oils from the chlorination of benzene: zeta-1,2,3,4,5,6-hexachloro-cyclohexane having a melting point of 88 - 89°C and the chair configuration 1e2e3a4e5a6a . Unfortunately, American experimentators caused some confusion by calling the sixth stereoisomer they isolated eta-isomer, even though they were aware of our experimental results. The author has given a comprehensive report of this case in PROJ IX in "Re-reading - 66 years of chemistry" and also described the real eta-isomer he isolated; cf. and . It is still lacking the eighth theoretically possible C6H6Cl6-isomer of the chair-configuration 1e2a3e4a5e6a. In case of realisation, it would be the theta-isomer. Of the 1,2-dibromo-3,4,5,6-hexachloro-cyclohexanes we isolated 4 isomers: PROJ IX in . * Based on the results described in Mitt. XI, XII, XVI, XXXI, XXXII, XXXIII, XLVII, XLVIII, LI in ; also see summary in Mh.Chem.86, 101-116 (1955). hexachlorocyclohexane isomers, “low melting salts like alkylated imidazoles and AlCl3” turned to be useful: Inorganic-organic solvents: PROJ IX. 1949 we used compressed CO2 as a solvent and as a reaction medium, for instance : “C6H6Cl6-isomers + amino acids in CO2 with and without solvent addition” [10a] and other reactions in or with CO2; continued for many years (unpublished). in the case of Y = CH4 with the aim to gain CH4 from CH4(H20)x and simultaneously to eliminate CO2 - which would concile two things. In our methan-ice-experiments we tried to find out the best pressure and temperature for the methane-reaction in presence and absence of NaCl [10b]. The method to use CO2 injections (CO2 as an "expensive" waste product) to improve mineral oil recovery[ii] has been in use since the nineteen nineties; for example, STATOIL-HYDRO has been depositing CO2 below ground in the Sleipnir West Field since 1996. Oil companies take the unpopular "anti-climate" gas and pump it into their reservoirs to improve oil recovery. Those industries using methane ice will become a large CO2 consumer and thus CO2 customer. Already at the beginning of our solvent experiments we made a big difference between “low melting ionic liquids (I , low viscous) and salt melts with high melting point (II, high viscous), when it was a question of the substitution of conventional organic solvents. Compressed CO2 (III) belongs to nonpolar solvents, I-systems melting below 10°C are to take into consideration as substitute for polar organic solvents. Starting in PROJ. IX with experiments about the reaction of the 1,2,3,4,5,6-hexachloro-cyclohexane isomers with elementary sulfur in melted form, the focus being on the search for a use and/or as a solvent of the alpha-isomer produced in large quantities as a "by-product". Attempts at reacting more than 240 compounds with the alpha- and gamma-isomers, including anthranilic acid and alpha-D and alpha-L-amino acids, but also beta-alanine and many peptides. Test protocols from the years 1948 to 1951, 41 pages (secreted). The reaction of alpha-isomer with sulfur produced very interesting results (secreted). When gammexane is ground with anthranilic acid in ether a clear solution is produced which, after evaporation of the ether, yields a light-green product having a melting point of 126° to 127°C and containing 2 moles of anthranilic acid per 1 mole of gammexane. The bis-(anthranilic acid)-gammexane (I) obtained (molecule aggregate) dissolves in methanol/H2O, namely in 1 g I + 2 ml H2O + 5 ml of methanol. Dissolution stops when the water content exceeds 50 %. When looking for suitable solvents for alpha-amino acids + hexachlorocyclohexane isomers, "low melting salts" of alkylated imidazoles and aluminium chloride turned to be useful: "Inorganic-organic solvents"
Manuscript (memorandum) 1950, 15 pages, based on the lectures held at Hoechst on December 15, 1952. This memorandum resulting from experimental protocols on the "solubility of HCH isomer in imidazoles + AlCl3" and “reactions in CO2” had been submitted to the management of Farbwerke HOECHST in December 1950 with the request to pursue this field systematically in any way possible. The replacement of organic solvents by low-melting, non-aqueous inorganic-organic solvents that are suitable for regeneration opens a wide experimental field which the author was unfortunately unable to pursue because of time constraints. Unfortunately, this proposal backed by two lectures on December 15, 1952, was not taken up by Farbwerke HOECHST [lecture held on the occasion of a visit to the plant]. It is suggested to read the summary of the results on "ionic liquids" from the 90s in Chemical Reviews by Th. Welton [Chem. Rev. 1999, 2071 - 2083]. As mentioned under "re 14)", the author started travelling to Brazil for one or two months at least once a year from 1964 onwards at the request of UFSM to build up and organize a Chemical Central Institute with all chemical branches in Santa Maria, Rio Grande do Sul and to run this as a Coordinating Director after it opened in 1973, all at the expense of the Brazilian government. This was to continue for more than 20 years. This also applied for all travel within Brazil from Santa Maria to Rio de Janeiro, Sao Paulo, Brasilia and Roraima. During all the time the author worked in Santa Maria, he had a chauffeur-driven car at his disposal, as well as a secretary and a personal assistant by the name of W. Pollack (photograph) who also acted as his interpreter during the first few years. The author also received remarkable support from the personal secretary of the vice-chancellor (by the name of Machado, Chefe do Gabinete da Reitoria: photograph). The author was also assigned a full-service apartment on the UFSM campus which included drinks and a janitor (Zelador). Another fringe benefit was à la carte dining at the best restaurant of the town run by a Portuguese, again at no expense whatsoever to the author. An "Underberg" was served for disinfection purposes at the beginning of each meal. These descriptions of the one- to two-months sojourns in Brazil would not be complete without a few comments on the mentality of the people of this country. They exude a cheerfulness which becomes catching after a while. This is well characterised by two proverbs "God is a Brazilian; he will put things right" or "Da un jetinho" (There is always a knack"). This good mood always stayed with me for a good while after I returned to Berlin. One must exercise great care when criticising anything, because Brazilians are very sensitive, but one quickly adjusts to this. The same applies for the topics of punctuality and scheduling appointments. "Yes" in the Portuguese language is "si", but often "pois não" is often used in the same sense. 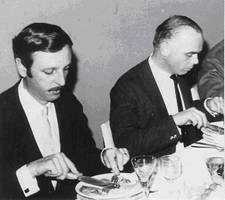 Photograph of the author's collaborator of many years, W. Pollack (right-hand side: personal assistant, secretary, translator) and R. Machado (left-hand side: chief aide at the vice-chancellor's office). Mr. Pollack was also the go-between with the university printers. He arranged for the translation of all lecture notes  and the production of the slides required for the author's lectures. He was also in charge of the 30 diagrams [Plates of large scale 1x2 to 2x3 meters] produced in Germany (samples in Plates 7, 8, 9, 10c, also illustration 6; origin of the plates in ). The editor of the above-mentioned Italian technical publication, Professor Dr. A. Coppadoro, made the author an offer to become a correspondent based in Berlin after he had given a lecture in Italian at the VIII Congresso Nazionale di Chimica in Genoa in June 1954. 40, 965 – 966 (1958) 44, 138 – 139 (1962) … ecc. 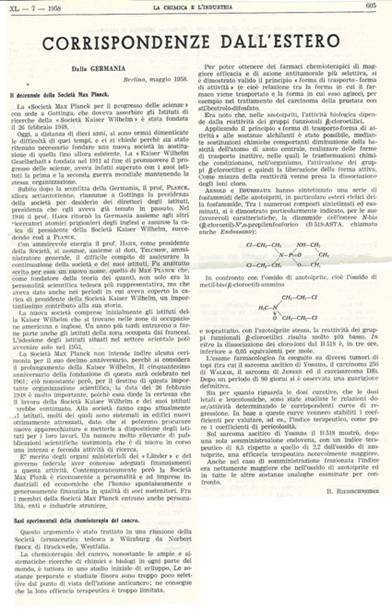 This cooperation with the important Italian technical publication LA CHIMICA E L’INDUSTRIA «Giornale di Chimica Industriale ed Applicata» and «L’Industria Chimica», Milano, had the following history: In September 1940, the author had sent an original manuscript to the editor of GAZZETTA CHIMICA ITALIANA, Rome, and asked to keep it until after the War [23, 4]. In 1947 and 1951, several of his own papers were published in this journal; cf . The chief editor at the time was Prof. Dr. D. Marotta, who was also acting President of the SOCIETÀ CHIMICA ITALIANA. His recommendation played an important role when the author was asked to become a correspondent of the technical journal LA CHIMICA E L’INDUSTRIA, as did the echo to the two monographs on contact insecticides published in 1947/49 : Table 3. Die in zweiten Artikel formulierten Verbindungen sind „LOST-Analoge“. Experimentelles über die Grundverbindung ß,ß-dichlor-diethylsulfid, in PROJEKT XVIII: „Permeation problems“ . Ber dtsch chem Ges 1930, 63,1868 (orientational experiments only) - Prof. Strauss died in 1930. When studying chemistry in Hamburg, Riemschneider received the task to prepare hexachlorocyclopentadien (a so-called „Literaturpräparat“) in a course of organic chemistry. Reactions 1-8 are realized and described in PROJ.XI and XVII. lab report June 1942, experiments carried out in leisure time in the laboratory of “Schule Base” in Brindisi, still in military service: Heeresbetreungskompanie, serving the Africa corps. Results: In series experiments of C5Cl6-preparations, experimentating with a surplus of C5H6, the yield of the waxy part I was increased. First hints as to insecticidal effect (flies) of I: Sometimes we found a lot of dead flies on or near the lab table. Treatment of I (melting within a certain range) in CCl4 with Cl2-gas resulted in an oil (II), containing 2 Cl more than I. II was more effective than I (flies). Lecture given 8 Febr 1943 in Prag in the German Army Explosives and Warfare Agents Research Establishment, “Heeresforschungsinstitut für Explosivstoffe”. Lab report of these experiments issued in 1943 in the mentioned Institute in charge of military service. but it showed unexpectately – corresponding to our own earlier observations (see above) – high chemical reactivity in general with unsaturated compounds of all kind. In this lecture, the author did not mention his observations from 1942 about the insecticidal activity of the waxy residues and its chlorination products. Experiments conducted at RUHRÖL GmbH, Bottrop, 1943-44 and repeated in Chem Lab, Inst of Hygiene, Univ of Jena, from Oct 44. Further public ations in PROJ XI and XVII in . At the end of the 40ies Riemschneider visited[iv] the discoverers of the DIEN-synthesis profs Dres Dr.K.Alder, Cologne, and O.P.H. Diels, Kiel, - both Nobel prize winners - to inform them personally about his discovery concerning the unexpected C5Cl6-chemistry and especially to reach consent to “leave this research field to him”. It had been the obvious thing to try - after our discovery of the unexpected high reactivity of C5Cl6 – to check the reaction of high substituted CN-analogues in DIEN synthesis, i.e. hexacyanocyclopentadien, C5(CN)6 (I) and tetracyanoethylene, (CN)2C=C(CN)2 (II). In the case of II we were already in 1949 lucky enough to find out that II reacted as philodien: PROJ I: there ref (34,102). The synthesis of I remaines still open, today. Together with Dipl.Ing.O.Matter, Vitznau, the author made a Swiss patent application. Lecture 1: "The spatial distribution of the Cl-atoms of Gesarol's active ingredient (later DDT) and of halogenated adducts from hexachlorocyclopentadiene and cyclopentadiene: DIENE group insecticides, eg M 410 (C10H6Cl8) as well as M 393, M 377, M 344"
Lecture 2: "The naturally occurring insect toxin cantharidin as a model substance for developing synthetic insecticides with a five-membered ring structure, eg M 410 "
The author wants to take this opportunity to thank Prof. Dr. Pflugfelder, Zoological institute of Jena University for his help in this experiments. This report about the hexachlorocyclopentadien chemistry was handed over in Dec 1947 to Farbwerke HOECHST for the Patent Department and for the Department of Plant Protection – together with some material collected as „Mitteilungen des Physiologisch-chemischen Instituts der Universität Berlin“. More details about hexachlorocyclopentadien chemistry in PROJ XI  and XVII . the discovery of the unexpected high reactivity of hexachlorocyclopentadiene and the insecticidal properties of pertinent adducts are entirely due to Riemschneider M 410, C10H6Cl8; cf SPECIAL PART J). In his lawsuit between the HYMAN Company of Denver and VELSICOL Company of Chicago HYMAN asked Riemschneider for proof that he had had discovered M 410 (C5Cl6 based) before him[v] and VELSICOL. However, this only succeded in part. Privately speaking HYMAN was convinced; cf. ADDENDUM next page. The two directions of work „C5Cl6 chemistry” (Riemschneider, Hyman) and “metalorganic Sandwich compounds, based on cyclopentadien” (Wilkinson, Fischer) were taken into consideration by the committee at the Nobel prize deliberations in 1972/73. In 1973 collegues from America informed Riemschneider of the situation and that Hyman had already passed away . 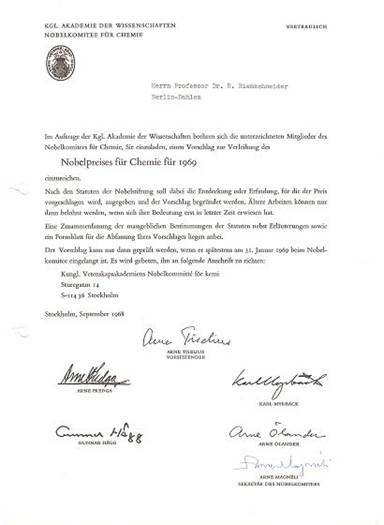 Since 1968 there was a contact between the Nobel committee and Riemschneider as one can see from a copy of the letter by the committee inviting Riemschneider to propose a candidate. Nobelprize winners profs Dr.A.Butenandt and Dr.Richard Kuhn, the discovery of the high reactivity of hexachlorocyclopentadien and the insecticidal properties of pertinent adducts are entirely due to Riemschneider: M 410, C10H6Cl8. Riemschneider as you can see from a copy of the letter written from the committee inviting Riemschneider to propose a candidate. Company concerning CHLORDANE, ALDRIN and DIELDRIN (Hyman’s two own later developments[vi]) went through tree instances. Results: VELSICOL was permitted to produce CHLORDANE and SHELL took over the production of Hyman’s ALDRIN and DIELDRIN; cf. endnote 26. In Germany: Independent of all this trouble, Farbwerke HOECHST produced - in cooperation with Riemschneider - THIODANE [11b]. Two patent applications entitled "Pest control agents"
2) "Insecticides based on adducts from tetrachlorodifluorocyclo-pentadiene (C5Cl4F2) and cyclopentadiene and post-chlorination on chlorine number 6: C10H6Cl6F2". already worked out and published, of the chlorine compounds C10H6Cl8 (M 410) [or C10H7Cl7] and the adduct precursors C10H6Cl6 [or C10H7Cl5], known to be active. Pest control agents, containing chorinated hydrocarbons of the general formulation A and B, that are obtained as follows: Chlorination of cyclopentadiene with alkaline hypochlorite solution [1 : 6 to 1 : 7], initially in the cold, then at temperatures up to 60°C and subsequent direct chlorination of the organic phase of the reaction mixture in the presence of UV light or other catalyzers, preferably post-chlorinated on a chlorine number of a reaction mixture from 8 or 7, related to C10. A patent application by Farbwerke HOECHST became known on 06 Sept 56 [F 8439 Iva/45 I, entitled Pest Control Agents, applied for on 26 Feb 52, ie 5 years after receipt of the text of the patent applications of 26 May and in June 47] in which the active agents formulated by the author in the patent claim to application 1 were claimed by reason of tests by Hoechst's Plant Protection. The chemical page of the specification corresponds exactly to the application text the author had made available to the management 5 years before the application. However, so as not to endanger HOECHST's application, the author agreed in 1955 that literature as well as his papers on hypochlorination not be quoted after the fact. The author forwent being named as the inventor as the experimental part of the application by and large only contained biological data and as it was already clear at the time that - in view of developments in America: aldrin, dieldrin - the object of the patent would hardly become significant . On the occasion of the presentation at the OKH in Berlin in December 1942 and after his two lectures (819a, b) in , also in Berlin at Jebenstrasse, the author had suggested to Major Kassuba who chaired the presentation and gave the introductory address to the lectures to use a class of compounds rich in N such as tetrazoles, pentazoles, their amino derivatives such as diaminotetrazole (V) and their salts (e.g. V-perchlorates, V-azides), azotetrazolates, etc. in combination with compounds containing NO2 groups as high-energy compounds. Formula Summary I: "Projected high-energy compounds of the class of representatives in N: N3 to N10 (1942)"; cf. also : (819b) there para. g). These experiments were then continued together with engineer O. Matter in Switzerland from 1953 and in Brazil from 1970 onwards; cf. in : PROJ. I 5,2. The combination of V or V-derivatives with trinitro compounds and the use of azo­tetrazolate salts (IX in Formula Summary I) had yielded excellent results regarding the characteristics required of explosives in 1954: Experiments carried out by Matter at his own explosion site on Vierwaldstätter lake (unpublished, secreted - even after Matter's death). He developed data regarding the heat of explosion and detonation (P, D), stability (impact, heat, friction, electrostatics). During his visit in 1954, Mr. Matter entrusted the author both with all the data and the information regarding the compounds used. 1) with letter from Dec 12th, 1956 sent to the “Bundesministerium für Verteidigung” in Bonn, confirmed with letter from Dec 21st, 1956. 2) starting from J. Thiele, Liebigs Ann.Chem. 270,1 (1892) and R. Stolle, H. Netz, O. Kramer, S. Rotschild, O. Schick, J. prakt.Chem. 138, 1 (1933). Thiosemicarbazide was converted into 1,5-diamino-tetrazole (V) with PbO and NaN3 in a CO2 atmosphere via an intermediate with HN3. The Pb azide resulting as a side product causes problems and is therefore unsuitable for industrial use. Another method of production for I is desirable: I forms salts with perchloric acid and hydrogen azide. Diazo treatment of diaminoguanodinium-halogenids in a narrow pH range 7,6-8,2 at room temperture (30-35° C). Reaction also dangerous: azid formation if pH not taken into consideration. To find out the best pH range we carried out 14 series experiments behind a protecting iron plate because of the expected azid formation. The author owes thank to drs M M Faria and F R Pesserl for co-operation and their courage - 8 explosions! Patentapplication O.Matter, inventor: Riemschneider und Matter. V was prepared in accordance with R. Stolle et al., J. Prakt. Chem. 1933, 138, 1. Because of the risk of explosion, very small batches were used to obtain sufficient V.
55 ml of an aqueous solution containing 4.5 g of diamino guadininium chloride and 1.5 ml of concentrated HCl are prepared under an exhaust hood behind an iron plate. Diazotisation with sodium nitrite is carried out under an N2 flow at 2 to 4°C: 20 ml of nitrite solution containing 2.5 g of NaNO3 are added dropwise with strict observation of the required temperature. After 45 minutes, the pH value of the reaction mixture is adjusted to 8.0 to 8.2 with Na2CO3 and stirred slowly at 45°C for 25 minutes, still under nitrogen. After that, the N2 flow is concentrated in vacuo until dry (keep a safe distance!). After cooling, repeated extraction with a little ethyl alcohol at 60°C and recrystallisation from water as before is carried out, V mp 185°C (low yield). R. Riemschneider, A. Kühnl (1943). 4 g of fresh prepared V are added to 3,0 ml of 66% HNO3 at 20° C in N2-stream and very slowly heated, then under cooling given to the clear solution ethylether in amount of 25-35 ml. The precipitated cristals are filtered off and washed with ether, dried over P2O5 after cristallisation from ethanol: 2,5g V-nitrate, mp 135-138°C. Observing the above precautions and working with grip arms, 2 g of V are dissolved in 25 ml of high-purity methyl alcohol. 1.5 g of concentrated perchloric acid are added gradually with slow stirring, still under nitrogen. After reacting at 20°C for 1.5 hours, the mixture is extracted with ethyl ether, mp 97-98°C. The explosive characteristics of these compounds prepared in Vitznau and Berlin. V, V-nitrate and V-chlorate, were expertly tested by engineer O. Matter at his testing site for explosives on Vierwaldstättersee (near the Rütli field) and compared with TNT and the pentaerythrite nitric acid esters we developed later. Data regarding the heat of explosion and detonation (P,D), stability (impact, heat, friction, electrostatics) were collected. Result: V-nitrate, V-perchlorate, and V-azide are comparable with TNT. Detailed experimental data are set forth in specification of the Swiss Patent applied for by O. Matter, inventors: R. Riemschneider and O. Matter. The letter from Mr. Matter to the author in December 1954 expresses delight that the three V-salts have explosive characteristics comparable with TNT. More details in the essay “High Energy Compounds – Explosives“ later to be published in this JOURNAL with the ten Formula Summaries A - J plus Experimental part, 40pages. The author considers his activities in chemistry in Brazil, in Japan, in Italy and in his own country and shows who helped in his career. This paper gives an impression how politics influenced the author’s life and activities - more or less negatively – and his “fights” against politics - looking for ways-out. All resistances and intrigues have been got over, and in the end chemistry won. The presented results, >1400 references in , have been be possible only with the help of many, many co-workers like students, candidates of examination papers, collegues, and employees in Germany, Japan and Brazil, named in . The author wants to thank all of them herewith once more.- The long list of Diplomanden, Doktoranden and Lehramtskandidaten incl. titles of the papers, presented in different universities (HU, FU, UFSM, and together with collegues in others) will be published separately elswhere, corresponding to the XXVI projects and other data, not regarded in . It is planned to publish the above mentioned extensive co-worker list together with the author’s patents and expert witnesses, every title containing a summary of the main results, the patent claims and reasons for expert opinion. Citation  goes into discussions of the author with Professor Linus Pauling [double Nobel Prize winner: Chemistry and Peace], namely discussions from the years 1969 - 72 primarily dealing with the vitamin C-complex [L-ascorbic acid plus dehydro-ascorbic acid]. - "Stability of hydride ions in aqueous solutions"
- "Organic compounds like vitamin C-complex, vitamin E-complex (NADH, flavonoids) acting as “transport vessel” for hydride ions[viii] (H atoms, respectively)"
He thus asked Prof. Pauling whether tests had been carried out "how tumours react to vitamin C applied intravenously, because the advantages vis-à-vis high oral daily administration are obvious"; when orally taken only small amounts of vitamin C will get into the blood. The author had not only cancer prevention in mind but also cancer treatment. Paulings answer to the above mentioned question was: "Not as far as I know. Also Dr. Iwan Cameron applied Vitamin C only orally (pure powder teaspoonwise) in his cancer prevention experiments. - Keep me informed about your activities!" In parallel running cell culture experiments, vitamin C - also given in comparatively high doses - had a negative influence on the growth of several cancer cell types, up to 30-40% growth inhibition, but it did not injure healty cells [unpublished at the request of Prof. Henneberg, director of the Robert-Koch-Institute, to gain time for clinical experiments. Professor Pauling agreed with this]. - later at the university teaching hospital of UFSM, Santa Maria, RS, Brazil, under Prof. José Mariano da Rocha Filho (former rector of UFSM). Only when comparatively high doses of vitamin C were injected, some success was shown in cases of cancer of the pancreas and the prostate. - Prof. Gerhartz was retired; once again, the "democratised“ Free University failed. - Professor Mariano was not a specialist in oncology and primarily had to devote his time to other duties. - The author was deprived of any possibility to continue this important research at the Free University xi. These results were communicated to Prof. Pauling in the hope that he would arrange clinical tests. Unfortunately, this did not come about, because Pauling died in 1994. Without the much criticised extensive "vitamin C experiments for cancer prevention" of Prof. Pauling (people said the oral dose was too high) and without Pauling's activities, ortho-molecular medicinevii would certainly not have been developed in such a prominent way. Without such suggestions, the author would not have developed "synthetic organ and plant extracts" (EP 0 552 616 B1) up to the production-line stage and organised their application in Asia. Nor would the author have arranged intravenous vit C-complex applications in hospitals based on his own cell culture experiments without the encouragement of Prof. Pauling. Without such encouragement and without the first positive clinical experimental results the author would not have carried out additional cell culture tests starting from the vit C-complex as described in the previous paragraph. - Walker himself reached an age of 116 years. - Pauling reached an age of 93 years. Walker founded the “Norwalk Laboratory for Nutrition and Research” in New York in 1910. The German translation of the Confucius quotation mentioned in Plate 6 was superimposed in German language during the TV broadcast of the opening ceremony of the Olympic Games in Peking on 8.8.2008 by the first German channel, ARD. During the 5-hour ceremony, significant phases of the 5000 year history of China were presented, for example the outstanding invention of gun powder, the production of paper, of typefaces, print, compass, Chinese legendary creatures (dragons), Chinese opera. The choreography with bamboo scrolls presented by 3000 Confucius students (with the words from the work "RONGO" superimposed - same words calligraphed by Professor Morino for the author in Plate 6) was most impressive. To make such a presentation successful, all of the participants had to have an excellent memory and ability of cooperation. There were also choreo­graphies involving 2008 Kung-Fu students and others, always presenting 2008 participants. On the whole, 15,000 different costumes were used, including the traditional costumes of the 57 different nations of China. This was possible only after many years of preparation and rehearsal of thousands of protagonists. The gigantic opening ceremony was complemented by breath-taking fireworks any many colourful light effects with huge projections. Colourful fireworks went up not only in the air and not only around the stadium - no, these extended over half of Peking, for example, the introductory footsteps that moved towards the stadium to the beat of seconds. The ARD-TV commentary did not do justice to this fantastic event; rather, it showed that the commentator did not know the theme and, like the closing interview, contained anti-Chinese slogans. Most of the major states had sent their presidents or high-ranking representatives to the Middle Kingdom; unfortunately, no important German politician was present. The performance given by the Chinese did not surprise the author in the least. In contacts with Chinese candidates for diplomas and doctorates and with representatives of the Chinese industry over many years, the author was able to see with his own eyes what these people can achieve. - Two outstanding associates of the author in a university career of more than 50 years came from China. In this essay the author treated the subject „Yeast“ only briefly. More details, especially about the author’s yeast patents, in the publication “Way out of the BSE-crisis” . o-diacetylbenzene - Permanganate oxidation in organic solvents. Voluntary Year’s Paper in chemistry for graduation at Matthias Claudius High School in Hamburg-Wandsbek, done from June 1937 till December 1938, submitted in Jan 1939: ms 96 p.
The largest part of the monograph "Knowledge of Contact Insecticides II" comprising 150 printed pages was written during the time of the Soviet blockade of Berlin(WEST): Berlin(WEST) was the official designation in the West for the three West Sectors. In contrast, Westberlin was written in one word starting with a "W" in the East . Instead of Berlin(EAST), the name used there was “Berlin, Capital of the GDR”. Since electricity was available in the West Sectors of the city for only two to four hours a day during that time and was usually cut when needed, the author rented a room in Berlin(EAST) near the Institute [The Humboldt University, at the time the only university of Berlin, and therefore also the Physiological-Chemical Institute were located in the East Sector of the city] unofficially, so to speak. This also had the advantage that the author saved the time for the twice-daily Underground trip of one hour each and was able to use the laboratories longer (During the time of the blockage, the underground ran only until 6 p.m.). Moving completely to the East Sector was no option for obvious reasons. Lecture „Molekulare Asymmetrie“, given on 28. 2.1948, cf also PROJEKT II in  and in : stereochem. Experiments carried out in 1998/99 in the labs of BRASTONE, Curitiba, PR, Brasil; cf. SPECIAL PART F). Lecture, held on 15 Aug 1964, colloquium Uni Santa Maria, in Sala de Atos, Edificio sede da USM [Universidade de Santa Maria], Santa Maria, RS, Brasil. For this compound the letter „ zeta” has to be cancelled. For this letter now belongs to the sixth isomer of the 1,2,3,4,5,6-hexachloro-cyclohexane series; see  and “zeta-Gezeter” in SPECIAL PART E). "Calculation and determination of dipole moments of theoretically possible HCH isomers and generally of polyhalo-cyclohexanes"
Manuscript June 1953, 14 pages, written after a 5-hour meeting with Prof. Morino in Hamburg; cf. PROJ XIX in . Gazz Chim Italiana 77, 607 - 611 (1947), date of receipt 12 September 1940, deposited in agreement with Prof C Weygand, University of Leipzig. Reason for the late release for publication at “re 1) WONDE” and PROJ. I 2 in ; cf. also . Lecture given to VII National Congress of Pure and Applied Chemistry in Milan, Italy on 19 Sept 1950. Abstract: La Chimica e l’Industria 64, (3) 99 (1950). cf also: H.Krauch, W.Kunz, F.Richter, Namensreaktionen der Organischen Chemie, Dr.A.Hüthig Verlag GmbH, Heidelberg 2001. Manuals for all laboratory courses (each course with 20 to 50 participants) were supplied to prepare for practical experiments and to set up the apparatuses. In order to get these laboratory courses going, all of the necessary chemicals and apparatuses were supplied from Germany by GTZ (Society for Technical Cooperation) as specified by the author, in quantities sufficient for 500 to 600 participants (DM 2 millions for the UFSM project). Remark: pH range important to avoid formation of dangerous azides. Chlorine chemistry for pest control research - starting in the 1940s - with regard to the inventors and their "fights"
ortho-Diacetylbenzene (o-Di) and some analogues in amino acid analytics and as marker in criminalistics - o-Di competitor of ninhydrin? World Review of Pest Control, Vol 2 29-61 (1963). can function as pollutant killer exterminating Cl-compounds? 15 Dec 1944 after the lecture of the author, held in colloquium Hyg. Inst., Jena Univ (SPECIAL PART J). [ii] The oil reserves in known oil fields are generally exploited only in an amount of 35 to 45 %. (After that, oil fields are deemed practically depleted). With new technologies for an increase of crude oil recovery, the yield can be improved, for example by pressing water (as such or in the form of steam) or gas (CO2) into the fields containing "residual oil". For example, this has been done in the Fahud field, the Natih field, the Amal field (Oman); in Chinese oil fields (water with surfactants). STATOIL-HYDRO-Industrie and the operators of the Norne field (Norway) are experimenting with micro-organisms (to reduce the interface tension of water-oil mixtures). [iv] reisend unter schwierigen Bedingungen, wie meist in den ersten Jahren der Nachkriegszeit: In der Berliner Blockadezeit Flug nach Hannover, von dort nach Köln (Übernachten bei Bekannten) per Bahn; von Köln nach Kiel über Hamburg (Verwandte), zurück über Hannover und Flug nach Berlin. [v] Auf Einladung von Hyman (HYMAN-Company) hat Verfasser am 15.5.1949 in Denver in einem round-table-Gespräch einen Vortrag zum Thema „Preparation and properties of M 410“ gehalten (Zitat in  ref (704). Dort erfuhr Verfasser, dass in der VELSICOL, Chicago, seinerzeit die Labor-Tagebücher täglich von zwei Personen unterschrieben worden sind, so dass Hyman sich nicht als alleiniger amerikanischer Erfinder beweisen konnte; vgl. auch nächste Endnote. [vii] Ortho-molecular medicine [orthomolekulare Heilkunde (ο’ρθοὀρθός = right)] founded by the American nutrition specialist Norman W. Walker , the physician Max-Otto Bruker, and the biochemist Irwin Stone, taken over in 1966 by Pauling, which led to the Institute of Science and Medicine founded later in Palo Alto, Cal., USA. In 1954, Pauling was awarded the Nobel Prize for fundamental research carried out in the 1930s on the "nature of chemical bonds", and, in 1962, the Peace Nobel Prize for his "commitment against tests with nuclear weapons". Between 1935 and 1952, Pauling had achieved important findings in the field of biological molecules, just to mention: haemoglobin structure, helical protein structure (consequence: double helix by J. Watson, F. Crick, R. Franklin), development of antibodies. - R.Rowghani, „Wie lebt man länger und fühlt sich besser?“ Linde-Kultur-Verlag Berlin 2004. [ix] During the years 1961 - 1967, Dr. R. Lipp prepared a post-doctorate paper on the "Toxicity of antibiotics on plants" under the supervision of the author. This topic was of great current interest at the time: In 1958, we were most surprised when we found in cell culture experiments how toxic antibiotics are for plants. This post-doctorate work was carried out at the Robert-Koch Institute and at the Department of Biochemistry and at the Institute of Biochemistry of the Free University from 1962 onwards. [x] Many years later, dehydracet acid years was interesting to produce resp to fortify “whitening effect” in cosmetic additives (EP 03 718 674.9 – PCT/EP 03/01874) from 24.02.2003. - Due to a total restructuring and reorganisation such as abolishment of the departments, the deans, the academic senate and the vice-chancellor, the elimination of the institutes, their directors and removal of their authority to issue directives, strengthening of the administrative body (from 1969, a presidential administration with the power to lead the teaching staff by the nose); increase of the number of 150 working professors to approx. 850 by law in August 1969 (without increasing the university budget): the so-called "discount" or August professors. - Due to the "interference of leftist students and so-called other service staff". These bodies had their spies everywhere, telephones were bugged, and relations with the industry were undesirable. There were "student working teams" without university lecturers, etc. At the end of the 70’s, Professor Gerhartz did not dare touch "undisclosed research projects". The author had received information and warnings primarily from Prof. Büchi of the Anthropology Department. Details on the topic "university reform" also in Re 7), in re 14), and in SPECIAL PART A – text at the end of each of these paragraphs. Responsible for this irresponsible law were the “Berliner Senator für Wissenschaft” Prof. W. Stein and G. Löffler, his successor.